I keep forgetting to tell you all about. When I catch my team in the morning, I let them walk into their stall where I have a bucket in each manger with a little grain for them. Then I go out and grain the colts and some other stuff. Well, when I came walking back into the barn the other morning, on the day the team had escaped, they had grain in their buckets from that day so when I went to catch them and they were gone, I didn’t add any, just turned them in their stalls. I got my chores done yesterday and then ran in to Spearfish to watch Gabe wrestle. I’d forgot how many people show up at them things! It was fun to watch and all them little people running around was fun, but we sat at the top of a huge gym and it was sweltering. With the odor of sweaty children! Man, I had forgotten what that was like. I guess I am more of a hermit. Too many people for my taste. You couldn’t hardly walk. Then I went and picked up Cindy when she got off work and we ran up to Deadwood to met fiends fro back east, but they were still putting around in Rapid, so we drove back to Spearfish so Cindy could see and hold Arabelle. Then back to Deadwood and hooked up with our friends. Had a good visit and did some gambling and ate too good. We headed back to Sturgis where Cindy stayed with her mother and I headed home. My first experience at driving on black ice. I went to turn and the car didn’t turn very well! So I slowly drove to Cindy’s mom’s apartment and when we got there I stuck my foot out of the car and man was it slick. but didn’t look it. I started for home very slowly, every once in awhile I’d stomp on the brakes to see if the road conditions had changed any and as I went east they just got better and better. By the time I was to the Belle Fourche river bridge about 15 miles out from Sturgis the pavement was fine. This morning there is a cold south eastern breeze blowing and it’s cold in the kitchen. 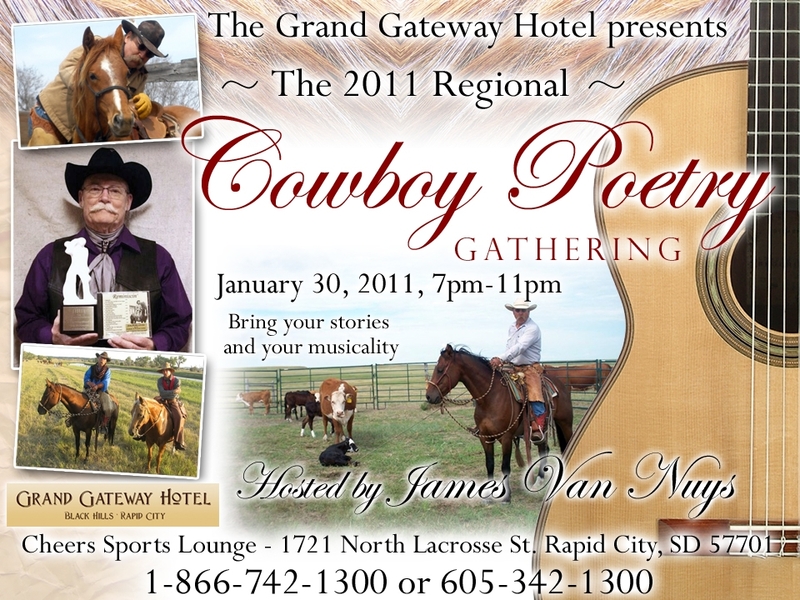 I am supposed to meet Cindy at Punkin’ Center when she gets off work and we will drive to Rapid to do a poetry gig. Snow this afternoon and tonight is predicted. We will probably get a couple 3 inches. Cold too. Not much above zero tomorrow. If I hadn’t told them I would be there, I’d stay home. Oh well, I am always up for a new adventure! turned 3 years old, on the 24th. Happy Birthday Sam. That is his dad’s hat on his head and his sox on his hands. Why? I do not know, Sam I am! Here’s some pictures of my personal skating rink! Today Cindy and I have been happily married for 20 years. Went out to harness this morning and my team has escaped and went out with the wild bunch. So I plugged the tractor in and I will capture them another day as I have to go to town today. It’ thawed all night and it is a skating rink out there this morning. Yes, yes, we are getting a January thaw, at least for a few days! beautiful day on the prairie! it was over 32 degrees when I went out to harness and feed! Ahh. January in west Dakota. Gotta love it! I have been working on getting the check’s in the Quicken file. Sure amazing ow much money passes thru’ my hands and then right out to the bills. 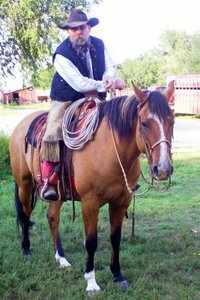 Got the gig at the Stockshow in Rapid, tomorrow evening. Supposed to start at 5 or so I guess. Then another on Sunday. Ought to be fun and they are giving me and Cindy a room for the night if we want it. So we can stay and make merry into the wee hours of the night. Another beautiful day in West Dakota. Sun is shining, 29 degrees and just small breeze of about 28 mph, moving some soft snow around. I suppose if you was a wussy or a girly man or just wasn’t used to it, it would seem kind of nasty, but we on the High Plains are used to this kind of weather and relish it! Bracing! Makes you feel like a he man! Laura over at Fetch My Flying Monkeys blog, (she is on my blog roll off to the side of this, but her blog is not for the faint of heart!I read it every day and sometimes several times a day. But be careful before you go to bad mouthing her as she has dinosaurs and flying monkey’s and was trained to kill in the Armed Forces of the good ol’ US of A!) has been going on and on about George Clooney. Like he’s something special. Oh, he can act a little bit and he’s got that over the hill scruffy, gray speckled beard that some younger women with a father complex seem to like, but other than that he’s just another run of the mill, liberal Hollywood dufus. I mean come on! He’s never had but one decent movie and that was O Brother Where Art thou. The only reason he was any good in it was that the Cohen brothers must have used a cattle prod on him to finally get him to show some real emotion. And I admit, he had some worth remembering and quotable lines. But I just don’t see it. I guess there are no accounting for tastes. But all this made me think about that paragon of southern womanhood who upholds all the claims to class and good nature and outstanding beauty, America’s sweetheart, Sandra Bullock. Now that’s a women! I’ve been seeing this and finally saw the whole story. Pretty scary. Check it out if you haven’t already. The Poor Farm: Me, Too. Coming down lightly, but it is starting to accumulate. Kind of a white world, but fun to feed with a team in falling snow and little to no breeze. It was 22 when I looked, so not too bad. Chance is supposed to be coming to pick up Hope today. She and the boys have been in Rapid at her sister’s the past few days. Hopefully the snow won’t bother them coming and going back. I built him a set of saddle bags as he will be calving some cattle soon down at his job. Sure glad we ain’t supposed to get any until after the 1st of April. Right now, 1st of May looks like a better option! Hard to believe that 30 years ago I rushed Cindy to Deadwood and about 5 pm (not quite an hour after we got there! ) our fist child, a son, was born. Happy Birthday Fr Tyler! May you have at least 70 more! All be joyous! Just like you.